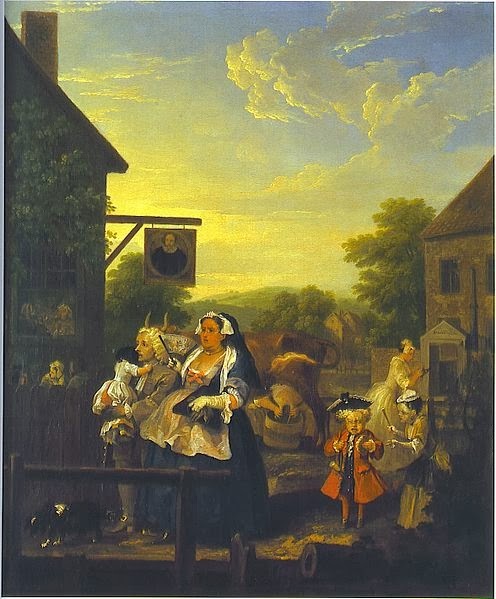 Four Times Of The Day is a series of paintings, which were later engraved, by William Hogarth. 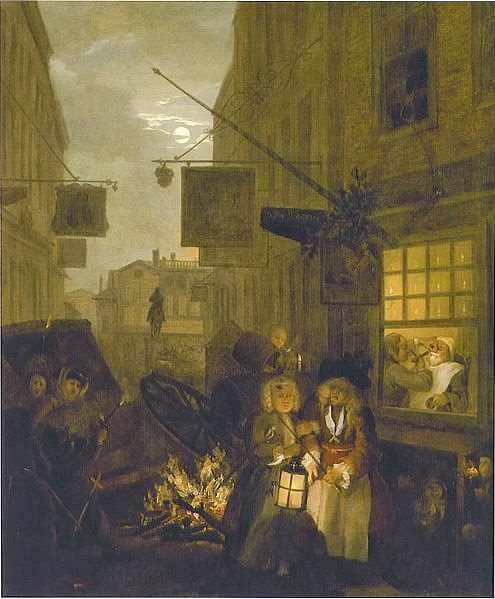 Unlike some of his other series, such as A Harlot’s Progress or Industry And Idleness, the Four Times Of The Day don’t tell the story of an individual, but depicts scenes of London life as the day progresses. It’s a cold winter morning. The buildings in the west side of Covent Garden piazza are covered with snow. A woman, wearing a pretty yellow dress and a muff, is going to church. She stops to observe two rich men kissing and fondling two young market girls in front of Tom King’s Coffee House (a famous venue often mentioned in pamphlets of the time), where a fight has broken out. Instead, she ignores her footboy, whose nose has become red from the cold and who’s carrying her prayer book, and the beggar holding out her hands to her. This spinster is said to have been inspired by a relative of Hogarth, who was so mad at him for it that she cut him out of her will. In the meantime, vegetable sellers are setting up their stalls, preparing for another day of work. The noises attract the attention of children on their way to school. In the background, a doctor is illustrating the beneficial effects of his medicines to an audience. He holds a bottle of his concoction is one hand, while with the other he supports a board with an image of the King’s arms, which indicates to his listeners that his practice is sanctioned by royal letters patent. Their motto speaks their manners—TOUJOURS GAI. When such a tinsell’d coxcomb meets our eyes. 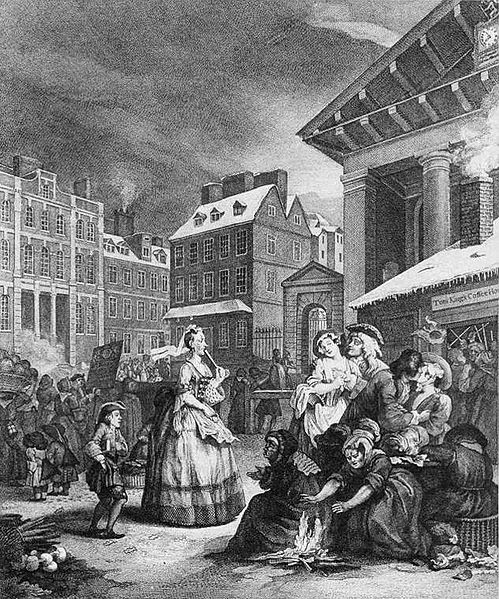 Hog Lane, the slum part of the district of St. Giles. Here stands a French Church, which is attended by a group of French Huguenots. They had arrived in England in the 1680s and set up businesses, working as tradesmen and artisans. 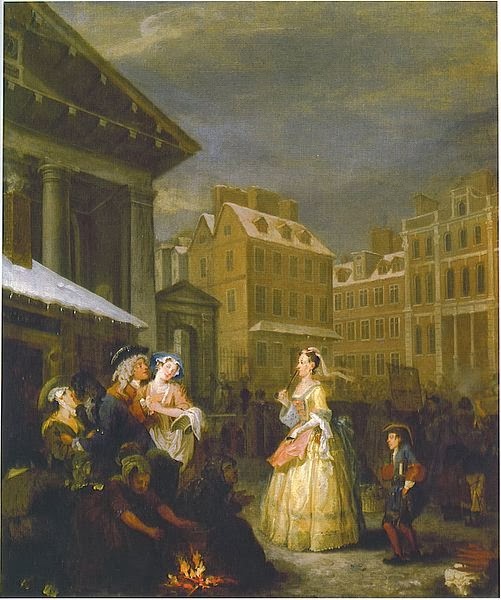 Hogarth, just like most English people, didn’t like the French much, and here he contrasts the wealth and primness of the young Huguenot couple and child, with the poverty and lasciviousness of the trio across the street. The street is “divided” in two, thus separating the two groups, by the dead corpse of a cat. 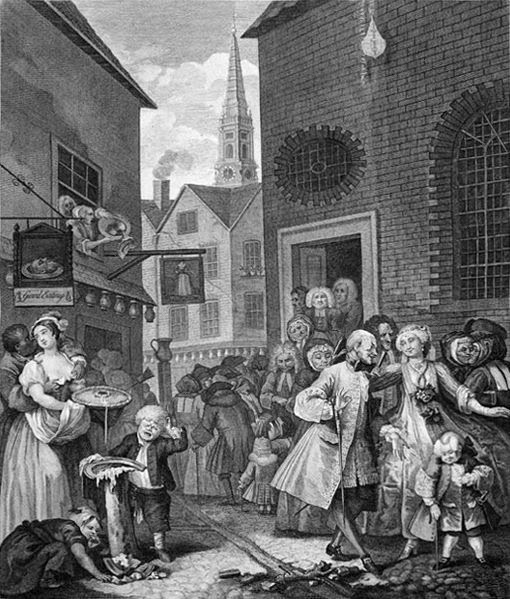 While the Huguenot child is decked in his finery, the kid across the street is crying because his pie has fallen down and is now being eaten by an urchin. Next to him a black man is touching the breasts of a woman holding a pie, distracting her from her work. The black man represents a wild and dangerous masculinity that will corrupt the woman’s innocence, a prejudice that was sadly prevalent at the time, and that, unfortunately hasn’t been complicated eradicated yet. Above their heads hangs the sign of the shop. It depicts the head of John The Baptist on a platter, which represents both good eating, and women’s idea of a perfect man. The sign near it instead depicts the headless body of a woman, which shows men’s idea of the perfect woman. Above the sign, a woman is throwing away a piece of meat as she argues, which contrast with the ideal of the good woman evoked by the sign. “Why, spouse, for shame! my stars, what’s this about? At that there garden, pr’ythee, do not stare! And tipt with gold is Hampstead’s lofty head. Nor dares her antler’d husband say ’tis wrong. In all their parents’ attic pleasures share. It’s a hot summer evening in the outskirts of London. It’s about 5 o’clock, as can be inferred by the cow being milked in the background. 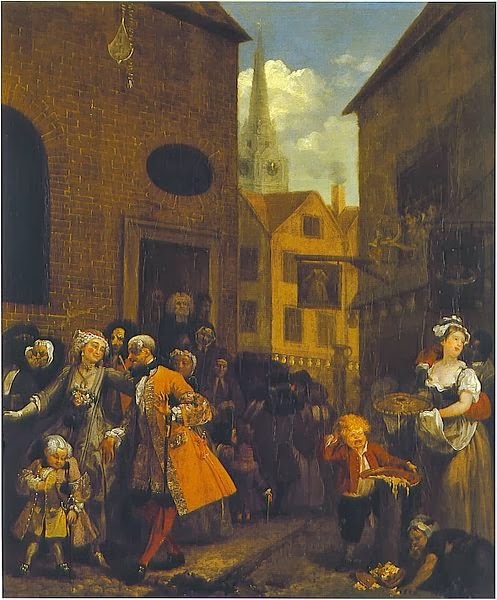 A pregnant woman, her husband and their children, are walking to Sadler’s Wells Theatre, which, at this time, was frequented mostly by tradesmen and their wives. The husband is a dyer, as his blue-stained hands give away. The cow’s horns behind his head reveal that his wife is cheating on him and that he’s not the biological father of her children, two of whom are walking behind them. The little girl is scolding the little boy, who cries. It’s another reminder that it’s the wife who’s ruling the family. In front of them walks a pregnant dog that’s longingly looking at the water. Inside the alehouse, people have gathered to have a refreshing drink, smoke and chat. 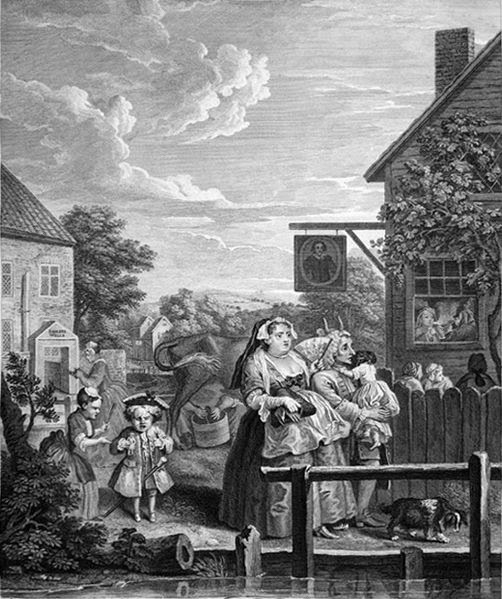 In this print, Hogarth is making fun of people escaping from the stifling heat and smoky air of the city, only to recreate that environment in the countryside. And all the region emulates the day. And o’er the waiter waves his clouded cane. We’re in White Hall, more precisely in a section of Charing Cross Road, where the equestrian statue of Charles I stands. The date, 29 May, Oak Apple Day, can instead by inferred by the oak branches above the barber’s sign. This public holidays celebrated the Restoration of the monarchy and got its name from the oak tree where Charles II hid after the royalists lost the Battle Of Worcester in 1651. Boys are celebrating this holiday by lightening a bonfire and playing with fireworks. Charing Cross was a central staging post for coaches, but because the road was so narrow, accidents were frequents. Here, the bonfire had caused a stagecoach to overturn. In the background, some tenants are taking advantage of the dark to escape, together with their furniture and possessions, from their creditors. In a barbershop, whose sign declares “Shaving, bleeding, and teeth drawn with a touch. Ecce signum!” (barbers also pulled out teeth at this time), a drunk barber is shaving a client, but he’s not doing a very good job. He cuts his client, who bleeds. Under his window-shelf, a homeless family has sought refuge for the night. In the foreground, a drunk Freemason (he can be identified by his Masonic apron and set square medallion as the Worshipful Master of a lodge and is said to depict Sir Thomas de Veil), walks with his guard. The dark spot on the guard’s head infers that he’s taking mercury pills to try and cure syphilis. 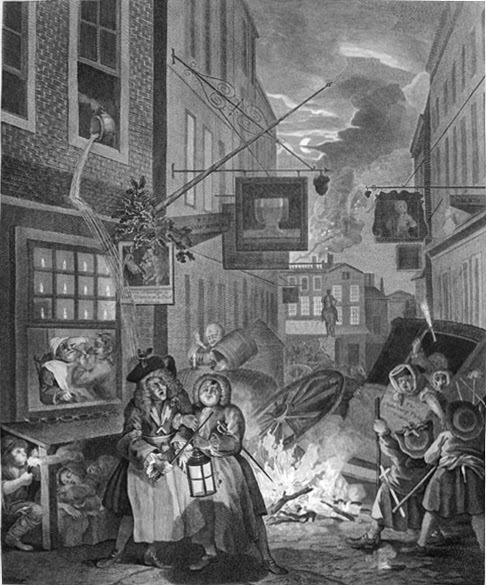 A woman empties the contents of her chamber pot onto his head, which refers to De Veil’s hard sentencing of gin-sellers, which was considered hypocritical, especially because he loved drinking.